I don't know where Verizon gets their network speed estimates for T-Mo and Sprint, but they seem pretty forgiving - given the speed ranges shown. 3-6Mbps down on WiMax is actually quite good (I hear from our EVO users that those are liberal estimates), but an upload speed of 500 Kbps doesn't exactly sound "next generation" to me. The vast speed range shown for T-Mobile indicate what I've heard from some T-Mobile users - even when they can get "4G," it's not exactly quick. By comparison, my AT&T 3G connection with full signal outdoors achieves 3Mbps down and 1.5Mbps up. Those speeds are well within what T-Mobile calls "4G", while my upload speeds make WiMax look dated. Some users of the Verizon 4G USB dongle have reported speeds in excess of 20Mbps on Verizon's LTE. That's more than three times as fast as the lowest tier of cable internet available in my area. Speeds will of course vary and inevitably drop as more users get on Verizon's 4G network, but their figures don't sound suspiciously optimistic: 5-12Mbps down sets a maximum well below what some of the early adopters have clocked in at. An upload speed of 2-5Mbps is impressive, as well. This next picture is an "internal comparison" of high-end Verizon smartphones, including the iPhone 4. 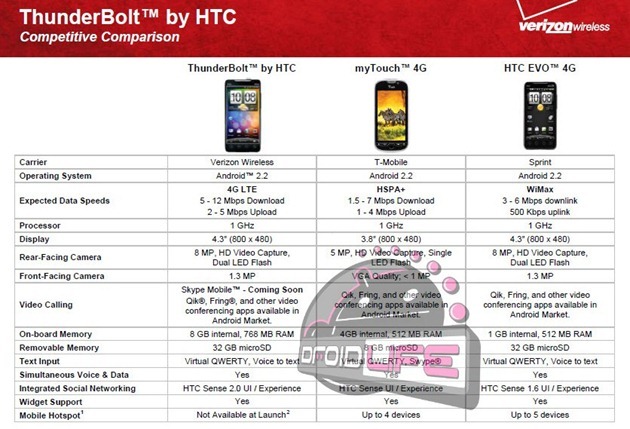 The Thunderbolt, though, sits at the beginning of the chart, with the iPhone 4 at the opposite end - probably to discourage the notion that they're competitors. Anyway, as you can see, 4G is number three on the list of feature comparisons - a feature only one of the phones on the chart has. 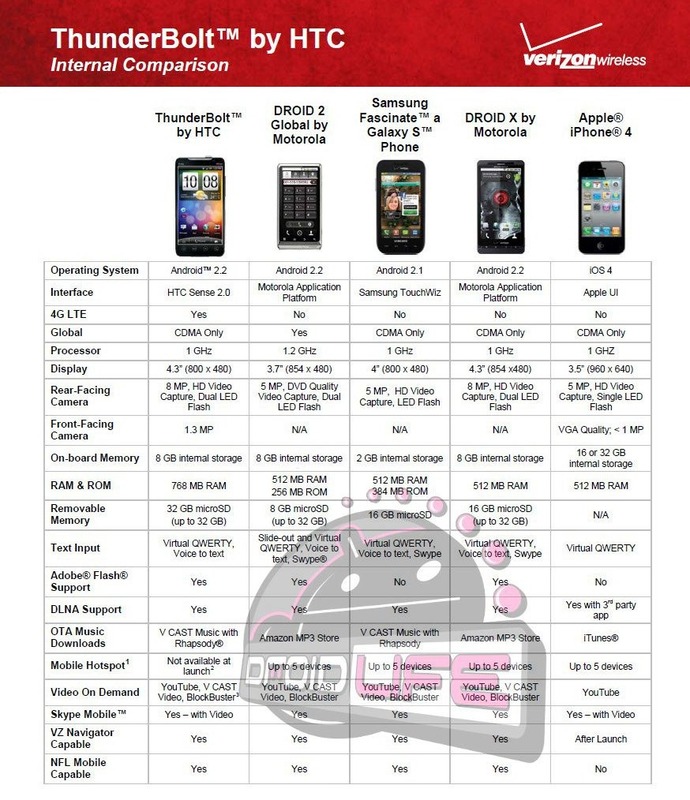 I apologize if what I'm extrapolating from this seems to be reaching, but I can almost guarantee there's a strategy to this chart: acknowledge the iPhone 4 exists, that it is a flagship device, and simultaneously make it obvious that if you want 4G, the Thunderbolt is your only option. 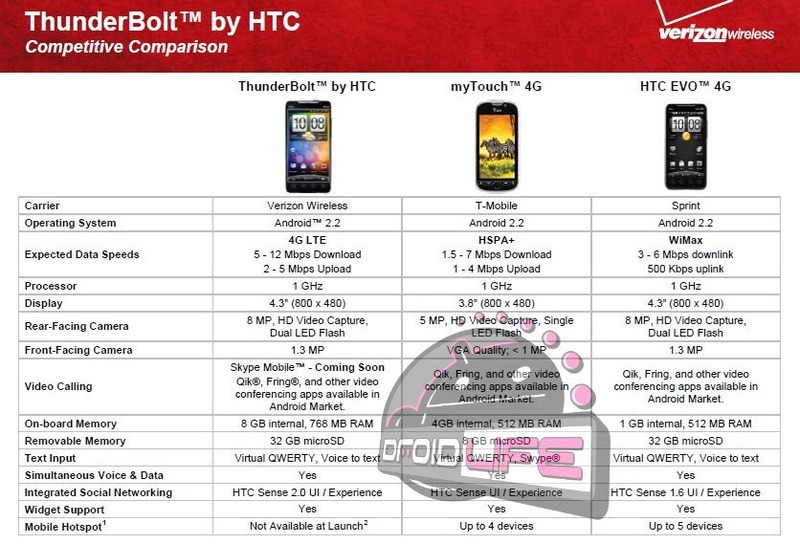 The Thunderbolt will bring more revenue to Verizon per handset sold than the iPhone 4, without a doubt. 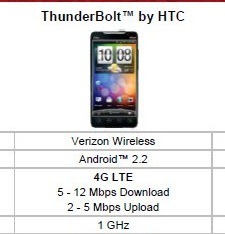 If the Thunderbolt ends up costing $250 on contract, it's safe to assume someone's making out like a bandit, and that the price is probably being inflated by the fact that it's the only 4G option available on Verizon for the moment. Add to that the premium cost of a 4G data plan (not confirmed, but almost a certainty) and it doesn't take a lot of calculus to see why Verizon wants you to buy this thing.